AMSTERDAM. Such a beautiful city. I had the fortune to visit this past week, to speak at the first ever DSGNDAY conference and Amsterdam UX. 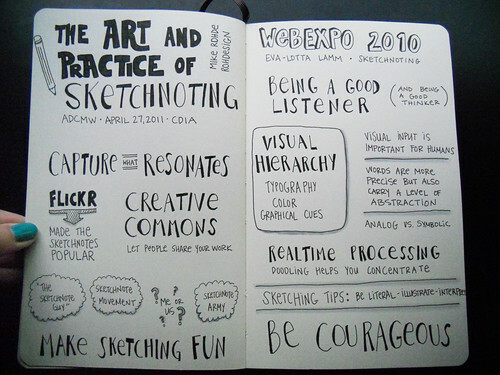 Because of good friends, I also enjoyed several informal sketchnote meetups that were great fun. I walked everywhere, and one day I managed to log 22,000+ steps, beating my old record in NYC. I ate delicious Dutch treats, and enjoyed tasty coffees and spent time with warm, wonderful friends. It was brilliant. View from the front door of Hotel Estheréa, near the canal in Amsterdam. A Pannekoecken shop in one of Amsterdam's narrow alleyways. Near the royal palace in Central Amsterdam. Starting my Amsterdam sketchnote travelogue. Lovely mural and a Dutch bike. View from my hotel room, Hotel Estheréa. Hotel room view of the canal and Singel (canal street) below. Cappuccino, greek yogurt with honey and walnuts, while I add to my travelogue. Sketchnote Travelogue; Pages 1 & 2. Vocabulary came in handy! Sketchnote Travelogue; Pages 3 & 4. Trying traditional Dutch foods. Sketchnote Travelogue; Pages 5 & 6. Canals and coffees. View from Broodje Bert, a people-watching and breakfast eating corner spot. Uitsmijter & cappuccino for breakfast. Eggs and cheese over bread with a salad! Met Jasper, Laurens, Jay and Jacqueline (not pictured) for a Sketchnote Meetup at Grand Cafe l'Opera. We had a fantastic time sharing experiences, coffees and lunch. Beautiful red shutters in Amsterdam. In the afternoon, I met my other friends Inge and Tamara for an afternoon coffee and another informal Sketchnote Meetup at REE7 on Reestraat. Sketchnote travelogue in process, with its creator! My buddy Jay, who helped me get to Amsterdam UX after the Sketchnote Meetups. Awesome dude and a great sketchnoter too. Cup closeups from my entry in the #cuppatition. Canal and tower at night as we walked to the venue for Amsterdam UX. Speaking to a crowd of about 60 at Amsterdam UX Meetup. What a fantastic time sharing with this group of Dutch Users. Thanks David, Tatiana and my friends at Publitas.com HQ! On the way to Compagnietheater for DSGNDAY. Stephen led us through the back streets of Amsterdam to get to the venue early. My view from the stage, speaking at DSGNDAY on sketchnoting. What fun! Close view of me speaking and drawing faces, Austin Kleon style! Photo of me speaking from up in the back row. An idea sketchnote from Zeger Van Hese, created during the exercise we did at the end of my talk. So cool! Thank you for a fantastic experience Amsterdam. I can't wait to visit again. NEW YORK CITY turned out to be just what I expected and nothing like what I'd expected, all at the same time. It was fascinating, rich, quirky, and fun. I want to go back as soon as I can. New York City has a unique vibe. It feels large and small, simple and complex, old and new. Somehow these strange contrasts work together perfectly. My wife and I enjoyed four fantastic days in the city. We walked to restaurants, rode subway lines, busses, boats and cabs. We ate delicious food and spent time with dear friends. By the end, we were physically worn out but our spirits were alive and happy. It was an awesome trip. NYC Subway map. Very useful! View from our hotel on 43rd Street and 2nd Avenue. Pad Thai & Pad See Euw, Talent Thai Kitchen, 34th Street & 3rd Avenue. Chrysler Building view from our hotel door at dusk. Chrysler Building view from our hotel door at night. Woke up in the City that Never Sleeps. Proof shot! I was on the Brooklyn Bridge. Scones and coffee at Le Pain Quotidien on 3rd Avenue. Street market on 43rd Street & 3rd Avenue. Grand Central Station main hall. Crosstown bus stop on East 42nd Street. Our Circle Tour of Manhattan happened on this ferry. UN Building. Our hotel was right behind it. Exquisite design details like this one for Borough Hall in Brooklyn, are everywhere in the subways. Upper Deck at Brooklyn Crab, Red Hook. Robin Williams sticker in Red Hook. Lady Liberty from Red Hook. 9/11 Memorial, South Tower location. Too many names on that monument. Such a tragedy. Grand Central and The Chrysler Building. Thank you, New York City! I'M EXCITED TO ANNOUNCE that I'll be speaking at SecondConf, a 3-day conference happening September 23rd through the 25th at TechNexus in downtown Chicago. SecondConf is a deliberately small, 3-day, single-track conference for the iOS and Mac development community, in the spirit of the C4 conference, which is no more. The conference has been mentioned by John Gruber on Daring Fireball and has recently sold out due to its popularity — a great sign. I'll be speaking about sketching as a visual thinking power tool for iOS and Mac developers and designers — expanding on my recent A List Apart article. I plan on sharing more examples of sketching as a problem-solving tool, along with practical ways attendees can make sketching a useful tool in their own software design and development processes. 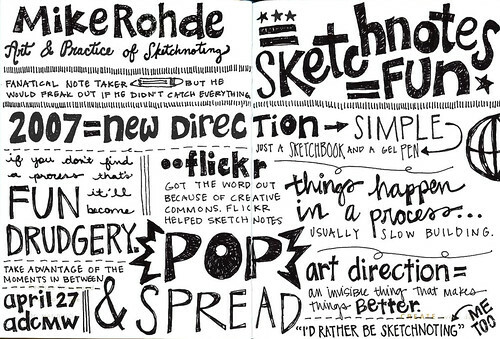 I can't wait to share and teach about sketching this September. Many hanks to David Kinney and Dave Dribin for this wonderful opportunity. Last week I had a wonderful opportunity to speak at the Art Director's Club of Metro Washington DC and had a great time sharing the story of sketchnotes and answering questions from the crowd of about 50 people. There are several great sketchnoters in the DC club who captured my talk in sketchnote form. Three of these sketchnotes were posted today. I've included their sketchnotes below with a little commentary on each one. It's fascinating to see such different sketchnote styles emerge from the same talk, captured from three different perspectives. I love it! Thanks ADCMW for the invitation to speak — I had a great time! On Wednesday, April 27th at 6:30, I'll be speaking to the Art Director's Club of Metropolitan Washington (ADCMW) on the Art and Practice of Sketchnoting. I'm very excited to be sharing the story of sketchnotes, the lessons learned from them and how those lessons apply to art direction, design and life. Thank you Carolyn Sewell and Eric Stewart for making this event happen! 1055 Thomas Jefferson Street, N.W. If you're in the DC area, please join us Wednesday night!